Special Event -- "An Evening With Hershey Felder"
The Man Behind The Legends"
ArtsEmerson: The World On Stage and the New Center for Arts and Culture will host "An Evening with Hershey Felder: The Man Behind the Legends" on Monday, June 4, at 7:30 p.m. at the Paramount Center Mainstage, 559 Washington Street in Boston’s Theatre District. Hershey Felder has won international acclaim for his portrayals of George Gershwin, Leonard Bernstein, Chopin and Beethoven, but for one night only, it will be the man behind the legends who will be the center of attention. Felder will talk with arts critic Joyce Kulhawik about his Jewish upbringing in Montreal, his musical passions, and how a visit to Auschwitz inspired him to create his one-man show, "George Gershwin Alone," which begins a two-week run at ArtsEmerson on May 30. 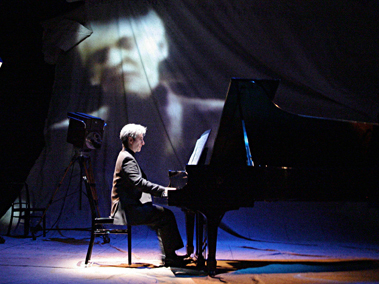 Felder will also talk about how he uses research and his multiple talents as an actor, pianist, playwright and producer to inhabit the minds and bodies of legendary music figures and to create such innovative musical theater pieces as "Monsieur Chopin;" "Beethoven, As I Knew Him;" and "Maestro: Leonard Bernstein." The New Center for Arts and Culture presents performances, art and ideas that explore universal themes through a Jewish lens. Programs reflect the spirit of contemporary Jewish culture, while speaking both to Jewish audiences and to the broader community. Under the artistic leadership of Rob Orchard, ArtsEmerson gives Boston audiences a new level of cultural choice, bringing professional American and international work to its four distinct venues. In addition to its acclaimed theatre works, ArtsEmerson presents adventurous, independent and repertory films on weekends, and offers a diverse music program including cutting edge indie rock and world music. For tickets and information, stop by the box office, call 617-824-8400 or visit ArtsEmerson.org.